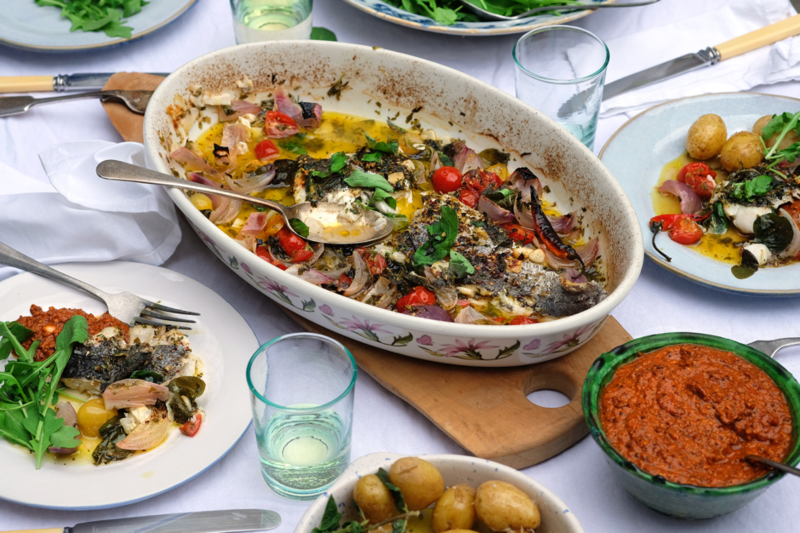 We love serving fish like this for a lunch or a dinner party, it’s so easy. We can’t bare the thought of an individual fillet, restaurant style, perched up on top of a pile of beans or wet spinach that’s gone a little dry on the edges. Yes that’s a big stereotype but we have all been there. This way you can lay your fillet in the dish, marinate and there its done, just needs to be popped in the oven about 20 minutes before serving. No fuss, no stress. We love doing this for a sharing dinner, alfresco in the warmth of a late summer evening, and how lucky we have been this year with the weather – an actual summer and the bliss of eating outside most evenings. We don’t cook that much with Hake – I don’t know why because we love it, its one of those ones that isn’t really on your radar so you forget about it and pick cod or haddock instead (very similar in taste and texture). It might also be because the majority of hake caught is shipped off to Spain – which funnily enough is where we had it recently. Lucy was away with her family and had given her brother the shopping list – 5 fresh sea bass for the BBQ, and he came back with no bass and one terrifying looking fish with spiky pointed teeth, which turned out to be hake – typical. 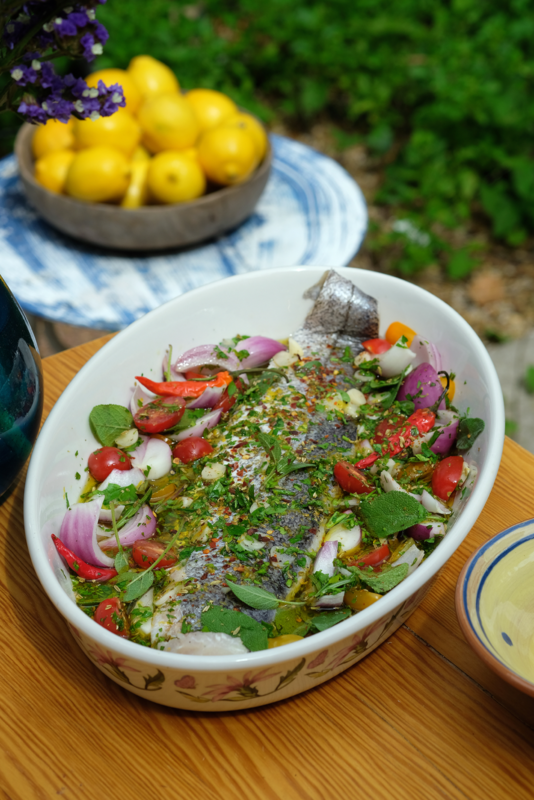 Instead of barbequing it we filleted and roasted it with herbs from the garden, garlic and white wine and it was so good – light, delicate and juicy (a weird description for a fish, but it was). Since then we have cooked hake for countless dinners through out the summer – sometimes more of an Asian vibe with chilli, soy and spring onions, other times simpler and more Italian with tomatoes, fennel, lemon and thyme. The sauce that we have used here is our adaption of a Romesco sauce, and it goes very well indeed – funnily enough it is a Spanish sauce. It is a nut and red pepper based sauce, traditionally from Catalonia. The Fishermen in the area used to make the sauce to be eaten with fish. It would go well with other dishes too – lamb, chicken or vegetables. We usually make a large batch and keep a pot in the fridge. If planning on making this for dinner we would suggest serving it with something simple and light – perhaps a rocket salad and some buttery new potatoes, or maybe crunchy green beans, followed by poached summer fruit and whipped vanilla cream. 1. To make the sauce place all the ingredients in the food processor and whiz – you want to keep it chunky, not smooth. Can keep in the fridge up to a week. 2. Heat the oven to 190c. 3. Place the fish skin side up in an oven dish. Pat the fish dry and with a sharp knife score the skin a couple of times. 4. Scatter the onion, garlic, tomatoes, chilli around the fish and slosh over some olive oil. Then scatter the fennel seeds, parsley and chili flakes, rub into the skin. Poor over the white wine, squeeze of lemon and season then place in the oven for 15 minutes or till cooked. If you want the skin really crisped then place under the grill for the last 5 minutes. 5. Take out the oven and serve with lemon wedges, the romesco sauce and a green salad.